The usual cleaning practice protocol for open wounds includes wiping with gauze pads soaked in irrigation solution starting in the centre of the wound and working toward the outside.1 No particular attention is paid to the periphery of the wound, and the suggested technique may relocate debris and bacteria from the center to the creases of the wound periphery. Patient Condition: 56-year-old female who has lymphedema, diabetes, hypertension, and is morbidly obese was admitted to Scarborough & Rouge Hospital presenting with a venous ulcer on her upper medial thigh that was triggered by a small trauma 3 years ago. Prior to incorporating the MolecuLight i:X into the patient’s treatment, many efforts with various dressings and NPWT therapy produced no improvement. 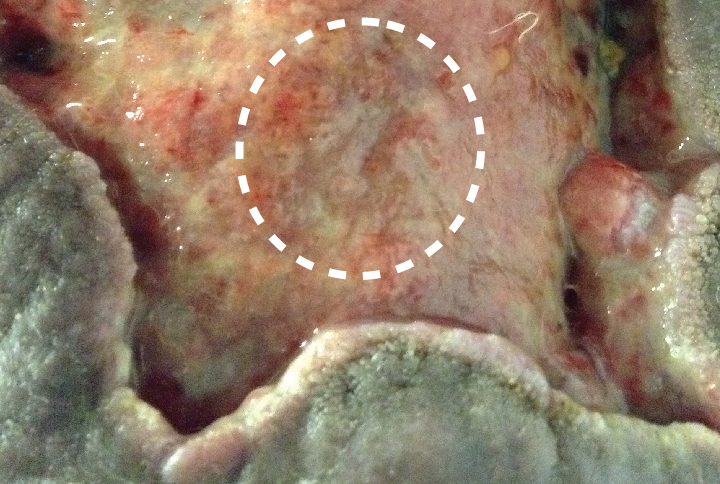 With this patient, cleaning was typically focused on the centre of the wound, as shown in Figure 1. 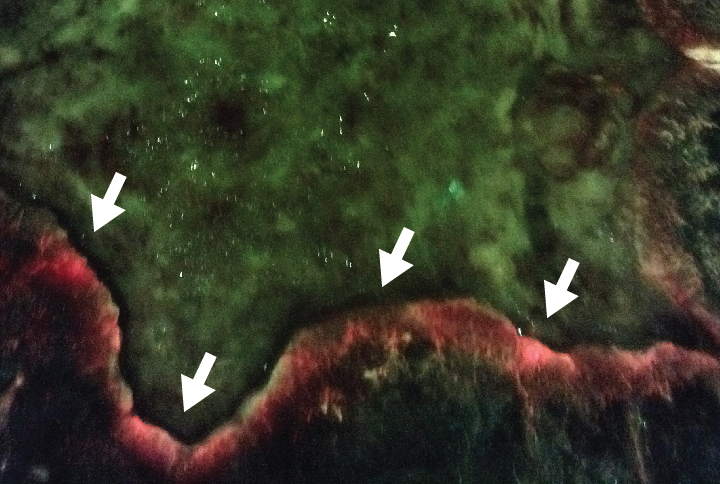 By incorporating the MolecuLight i:X (in Fluorescence Imaging Mode™) into the cleaning protocol, the clinician was able to visualize moderate/heavy bacterial load in the creases and at the periphery of the wound (Figure 2) in real-time. She therefore focused on cleaning those edges and creases and used the MolecuLight i:X images to instruct the home caregiver (patient’s husband) on where to focus cleaning. 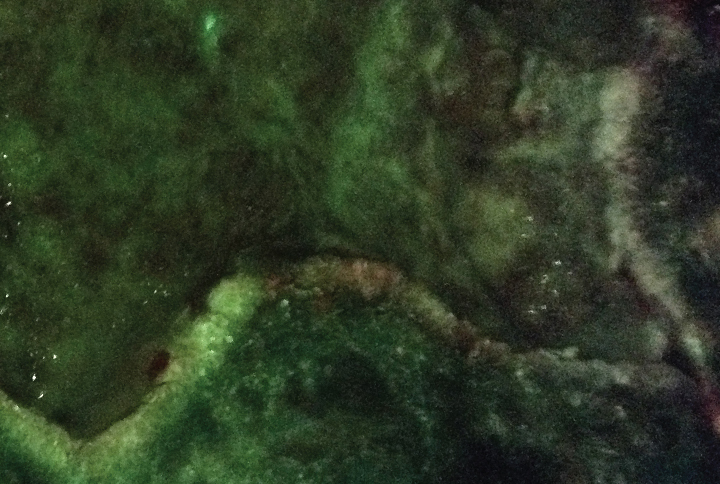 After two weeks of cleaning every 2-3 days with the guidance of the MolecuLight i:X, there was a remarkable decrease in red (bacterial) fluorescence at the periphery of the wound (Figure 4). 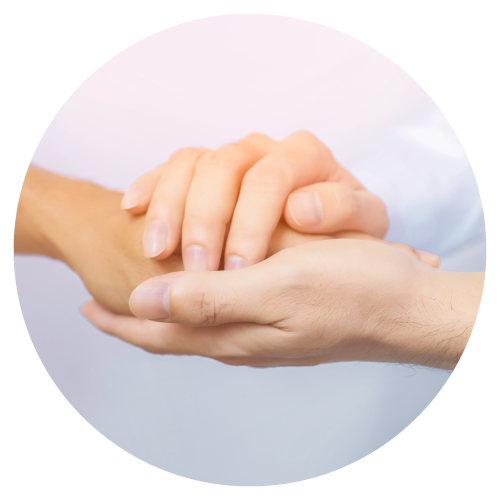 Furthermore, the wound bed began to granulate with the successful use of a Negative Pressure Wound Therapy (NPWT) device, which had previously failed with this patient. Images & Video provided by Rose Raizman, RN-EC, MSc, Scarborough & Rouge Hospital, Toronto, ON, Canada. 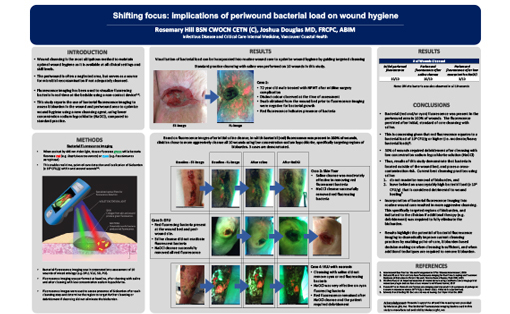 D. Sardina, is your wound-cleasing practice up to date?, Wound Care Advisor, (2013)Vo2No3. 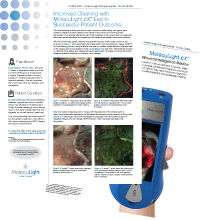 By incorporating MolecuLight i:X (in FL-mode) into the cleaning protocol, the clinician was able to visualize moderate/heavy bacterial load in the creases and at the periphery of the wound in real-time to focus on cleaning those areas.